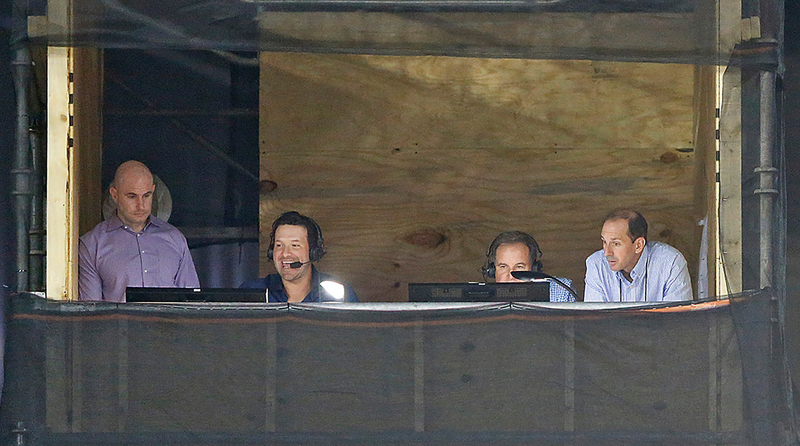 Tony Romo (second from left) debuted as an analyst in the CBS broadcast booth for Sunday’s Raiders-Titans game. • First Oakland drive, highlighting a rookie in his first NFL game on a big-time Oakland receiver: Romo interrupted Jim Nantz and blurted: “Look at this matchup. That’s the rookie, Adoree’ Jackson, on Amari Cooper.” Three seconds, presaging what was to come three plays later: an 8-yard TD pass from Derek Carr to Cooper, beating Jackson when Jackson gave up on the tackle. The Titans rookie will hear about that from his coaches. “You gotta make that tackle!” Romo yelled. And he was right—Jackson should have finished off the tackle. • Late first quarter, fourth-and-one for Oakland at the Tennessee 3-yard line, Marshawn Lynch run: As Lynch ran right, linebacker Wesley Woodyard hogtied him and flipped him over—but Lynch, in a veteran move, looked like he stretched the ball for a first down. “Are you kidding me?” Romo said, voice rising. “That should have been stopped! That’s all Marshawn Lynch! I think he got the first down. It’s gonna be close. You have a guy in the backfield with a CLEAN shot on him and he makes him miss. That’s why you go bring back Marshawn Lynch, right there. He’s still Marshawn Lynch.” It was a 75-percent good call … but Romo should have mentioned the guy who missed him in the backfield, Jonathan Cyprien, and the guy who tackled him but allowed him to get the first down, Woodyard.